Radio observations and modelling suggest that Sh 2-181 is an HII region ionised by a B0 to B0.5 class star. A 1978 paper identifies the ionising star as the B1 V class LS I +64 47. The nebula is connected to the Cas OB7 association in the Perseus arm. Avedisova suggests that Sh 2-182 is ionised by the B3 Ia supergiant HD 4694. More recent studies, however, conclude that Sh 2-182 appears to be a reflection nebula (not an HII region) and may be associated with the infrared source and protoplanetary nebula IRAS 00470+6429. This is an apparently large and distant HII region that is obscured by foreground dust. It consists of 44 thousand solar masses of ionised gas and is at least 3.9 million years old. The stars ionising the gas are unknown and are probably obscured by the foreground dust. Avedisova locates Sh 2-183 in star formation region SFR 123.20+2.83, with 16 components, including a water maser and 8 infrared sources. One of these infrared sources is the young stellar object IRAS 00468+6527. This object shows an extended irregular structure at radio frequencies as this 2.7 GHz image taken with the Effelsberg 100m radio telescope reveals. 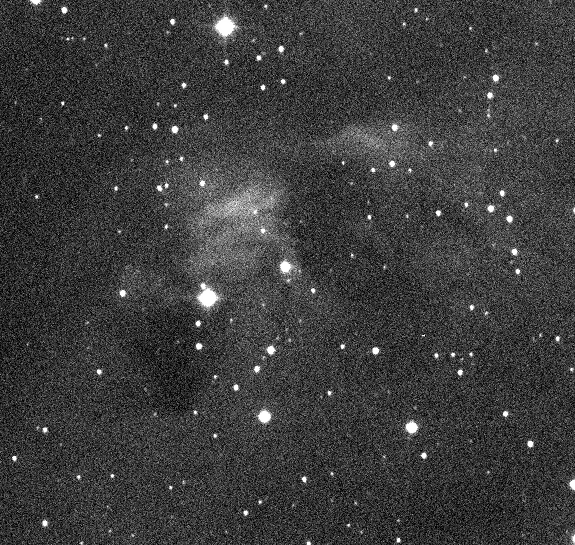 I've used IPHAS hydrogen-alpha data to create a black and white image of this highly obscured nebula here. Sh 2-183 is visible as a diffuse nebula bordered by more compact emission sources in this IRAS infrared image. If this object is really located at 7000 parsecs, then the size in the radio image suggests that it may be one of the largest star formation regions in the outer galaxy. Note, however, that streaming motions in the Perseus arm can result in exaggerated distance estimates if velocity data is used alone to determine an object's distance (and the current distance estimate is, indeed, based on gas velocity). Often called NGC 281, this bright nebula located far below the galactic plane is also nicknamed the Pac Man nebula by amateur astronomers after a 1980s-era video game character. IC 1590, the star cluster at the heart of the nebula, is about 3.5 million years old. The core of the star cluster IC 1590 is the trapezium system HD 5005, which ionises NGC 281 and contains an O5.5 class star. The distance to NGC 281 has been accurately measured via radio parallax as 2820 +/- 240 pc. It is highly unusual to find such a prominent nebula so far below the galactic plane and there is some evidence that it is on the edge of a superbubble that has blown out of the galactic plane, perhaps because of multiple supernova explosions. This nebula is often the subject of astrophotographers and there are many beautiful images of it on the Internet. One interesting false-colour version was Astronomy Picture of the Day. You can see a view of this nebula in infrared taken by the WISE satellite here. Avedisova says that Sh 2-186 is ionised by the B0 III giant Hiltner 102 and is part of the Cas OB7 association. It contains the infrared cluster [BDS2003] 51. This young (100-200 thousand years) star formation region is most likely ionised by a B0 class star and is surrounded by a 4600 solar mass molecular cloud. It is partially obscured by the Lynds dark nebula LDN 1317 and contains the infrared star cluster [BDS2003] 52. Russeil lists three potential ionising stars, one with a B2.5V class. You can view a good visual image here of this rarely photographed object and a fuzzy hydrogen-alpha image created from IPHAS data here. This nebula is prominent in infrared as can be seen in this MSX image. This is a planetary nebula with an expansion age of 7500 years. You can view a more detailed image of this nebula here. Phil Plait calls this the "Firefox Nebula". This faint and distant purple ball is a planetary nebula also called Abell 3. The Heart nebula is ionised by the IC 1805 star cluster, which is part of the Cas OB6 association, and is the location of the W3 / W4 radio sources. 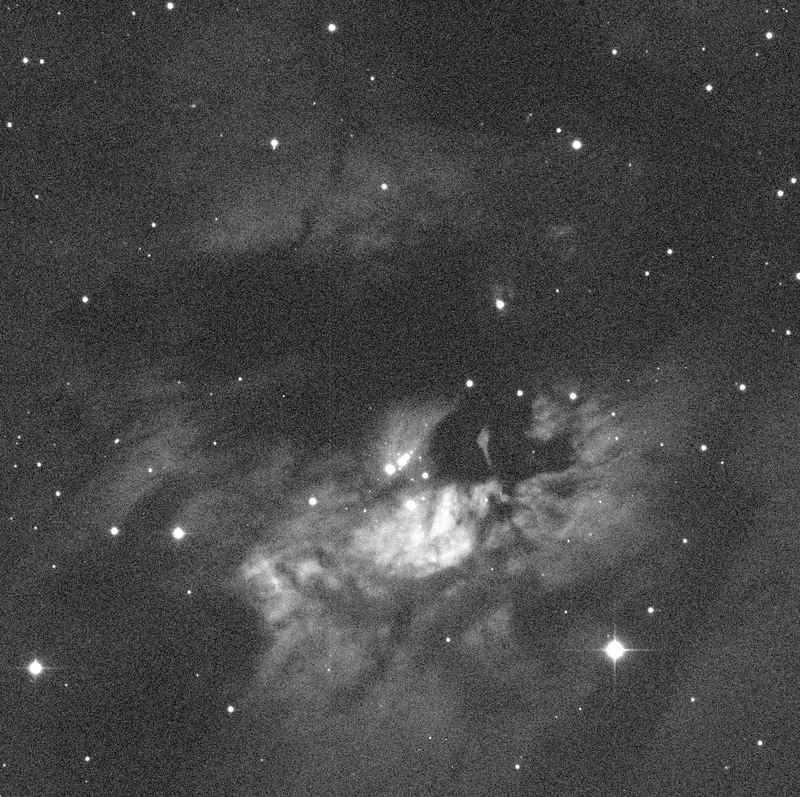 Avedisova places this nebula in star formation region SFR 133.69+0.99 with 86 components including 11 masers. IC 1805 contains at least 10 O-class stars including 3 extremely rare ultra-hot O4 and O5 class stars. The correct distance to the W3 (OH) star formation region within Sh 2-190 has been measured with incredible accuracy using radio parallax as 2070 +10 / -20 pc. For more information see the Heart and Soul (140° - 130°) sector description in the Commentary on the Galactic Plane. You can view a stunning image of the larger Heart and Soul region here.